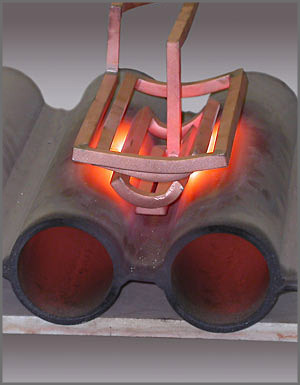 Induction heating is used for an ever-widening range of industrial and scientific applications: material joining processes such as brazing, soldering and curing; material processing applications including hardening, forging, annealing and melting; and component assembly processes such as epoxy bonding and heat staking metal into plastic. Our engineers have also applied the technology for catheter tipping, hot heading and other component manufacturing processes. Annealing and tempering are used to soften metal for improved ductility and machinability, as well as to relieve residual stress. 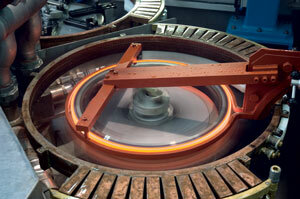 In contrast to hardening, annealing involves a much slower heating step followed by gradual cooling of the metal. Tempering refers to a reheating and slow cooling of metal which has become too brittle as a result of a hardening process. Flexible, epoxy-based gaskets can be bonded to metal or other conductive material without a third bonding agent. Our Epoxy Bonding Systems are ideal for this application. Induction heating has been used for bonding gaskets to metal automotive parts, thermoplastic composite bonding, and rubber washer/bumper assemblies. Brazing is the process of joining two or more pieces of metal or ceramic material with a molten filler metal such as silver, aluminum alloy or copper. Brazing requires a higher temperature than soldering but produces a very strong bond which withstands shock, vibration and temperature change. Brazing in a controlled vacuum or in an inert protective atmosphere can significantly improve overall part quality and eliminate costly part cleaning procedures. Industrial forging and hot forming processes involve bending or shaping a metal billet or bloom after it has been heated to a temperature at which its resistance to deformation is weak. Blocks of non-ferrous materials can also be used. This application involves heating a steel boiler tube assembly to fuse a nickel-based, hard-surfacing alloy which has been applied as a spray. The tube is coated with the alloy to provide corrosion resistance during use; wear-resistant nickel alloys are applied to new parts where wear or corrosion is anticipated, or to worn parts to replace metal lost through wear. Steel hardening consists of heating the material to a temperature over 723ºC (austenitic temperature) and then cooling the steel quickly, often with a quench of industrial water. The aim is to transform the structure of the steek in order to increase its hardness, its yield strength, and its breaking tension. The steels that are normally hardened with induction heating contain from 0.3% to 0.7% carbon. When one piece of metal is designed to be inserted into a second piece, induction heating can be used to "shrink fit" the two pieces together. The first or larger piece containing the opening is heated to expand the size of the hole. The second piece is then inserted into the opening, and as the first piece cools and shrinks back to its original size, the resulting pressure holds the two pieces together in a strong bond. This medical application involves heating nitinol stents to set proper size. The stents are slid over a correctly-sized mandrel, to which induction heating is then applied. Precise temperature control is required for this process. Hard metals can be melted with an induction heating furnace. The metal is placed on a non-conductive crucible; when induction heating power is applied, the eddy currents circulating within the metal effectively stir the molten mass as it melts. Very high quality, uniform melting can be achieved with precious metals, high quality steels and non-ferrous alloys. Induction heating can be used to quickly pre-tin solder paste in a copper electrical connector. With the right combination of induction coil and temperature, the solder paste can be melted within 10 seconds. A susceptor is a conductive metal material that is used to transfer heat to another piece of metal or non-conductive material. Susceptors are often made from graphite because it is highly resistive and very machinable, or alternatively from stainless steel, aluminum, or other materials. Induction heating can be used very effectively to preheat conductive materials for forging, welding, hot forming and hot heading. For example, the tips of turbine engine blades can be placed in a specially designed induction coil and heated to the desired temperature for welding repairs. The induction preheating step improves cycle time and reduces stress on the rest of the blade.